Lima Senior’s Taja Oglesbee puts up a shot against against Findlay’s K’La Henderson during Thursday night’s game at Lima Senior High School. 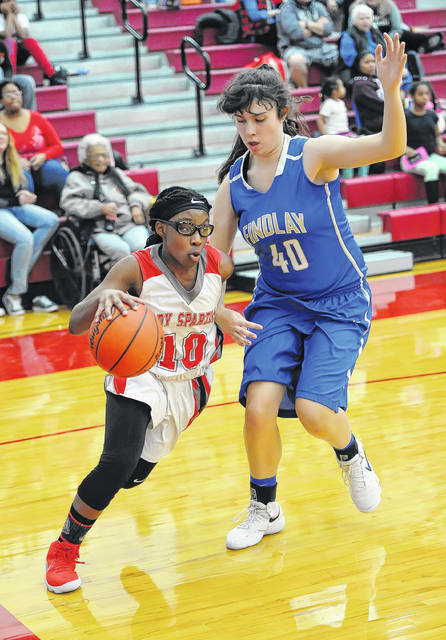 Lima Senior’s Nakiya Sigman drives against Findlay’s Chloe Holliday during Thursday night’s game at Lima Senior High School. LIMA — On paper, Findlay’s size looked to be a major issue for Lima Senior. However, it wasn’t just Findlay’s size that was a factor. Findlay’s outside-shooting prowess added to Lima Senior’s concerns in Thursday night’s Three Rivers Athletic Conference girls basketball game at Lima Senior. However, Lima Senior kept it close, took the lead late in the contest and held on for a hard-fought 51-49 victory over Findlay. 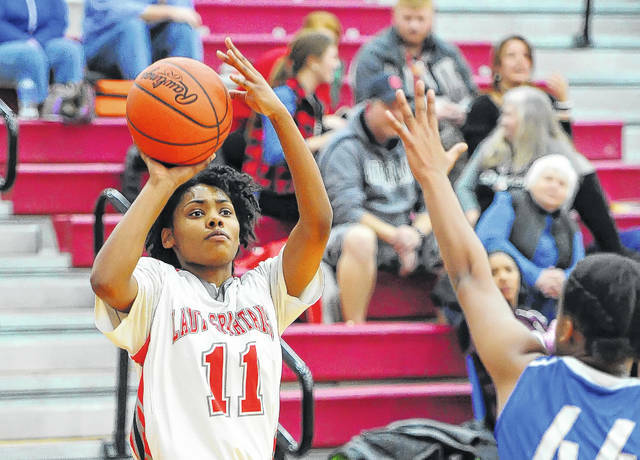 Nakiya Sigman led Lima Senior (7-8, 3-5 TRAC) with 14 points, including four 3-pointers. Taja Oglesbee and Destiny McDonald each added nine points for the Spartans. Katie Thomas led Findlay (6-9, 3-5 TRAC) and all scorers with 22 points, including six 3-pointers. Emily Heiman added 11 points and five rebounds for the Trojans. After not leading since early in the first quarter, Lima Senior claimed the lead late in the fourth quarter and held on for the dramatic win. The Spartans trailed 29-16 at halftime and then cut it to 39-37 by the end of the third quarter. A 3-pointer by Sigman with 3:20 left in the game, cut the deficit to 1, 46-45. Then a three by Oglesbee with 2:10 left in the game, gave Lima Senior a 48-46 lead – the first lead by the Spartans since early in the first quarter. Lima Senior hit three free throws in the final 30 seconds to push their lead out to 51-46. Thomas then hit a 3-pointer from the left corner to cut the Lima Senior lead to two points with a half a second remaining to play. But Thomas’ long bomb was too little, too late. Lima Senior managed to hit three times behind the 3-point line in the first quarter. However, Findlay not only got it done behind the 3-point line, but also sliced its way inside, en route to a 14-9 lead by the first stop. Thomas led the way for Findlay, scoring eight first-quarter points. Thomas continued to have the hot hand in the second stanza, hitting two more times behind the arc. Thomas scored 14 of her points in the first 16 minutes of action. The Trojans connected five times behind the 3-point line in the first half. Findlay picked up right where it left off, hitting three 3-pointers in the third quarter. At the 1:30 mark of the third quarter, Lima Senior cut it to 3, 37-34, on an old-fashioned 3-point play by McDonald. Then with 40 seconds left in the third stanza, Sigman hit a three, cutting the deficit to 2, 39-37, which held up until the end of the quarter. Lima Senior won the boards, 31-28. From the field, Findlay shot 43 percent. Lima Senior shot 34 percent from the floor. This entry was tagged limasenior. Bookmark the permalink.